And what a night it was a month ago on December 7th! 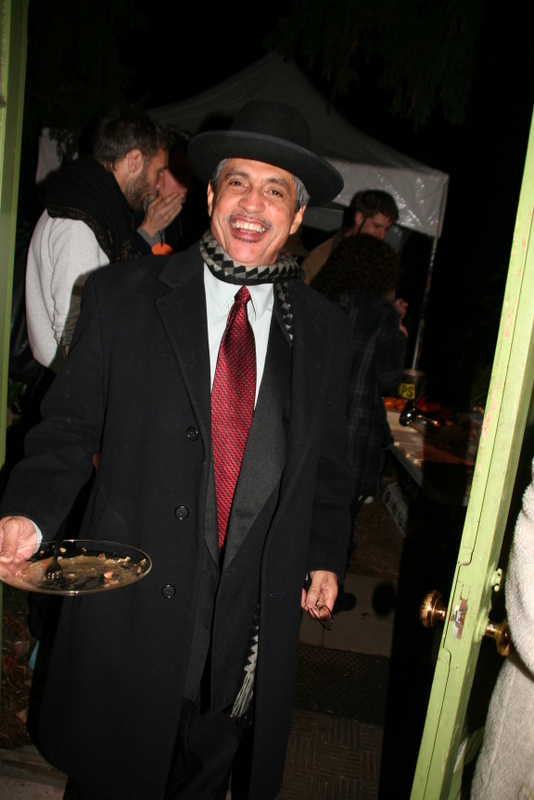 So cold, we squeezed almost everyone into the lobby, which made us much warmer and cozier, like an art opening, as pizza appetizers circulated hot out of Ray Cirino’s astounding rocket stove with great local and organic veggies donated by Mud Baron and Camille Cimino. 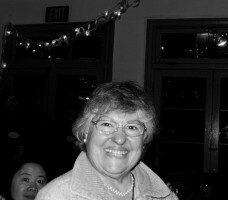 Early LAEV visionary Maria Davalos (photo by Yuki). part, 15 dozen fabulous homemade cookies were provided by early LAEV visionary Maria Davalos. 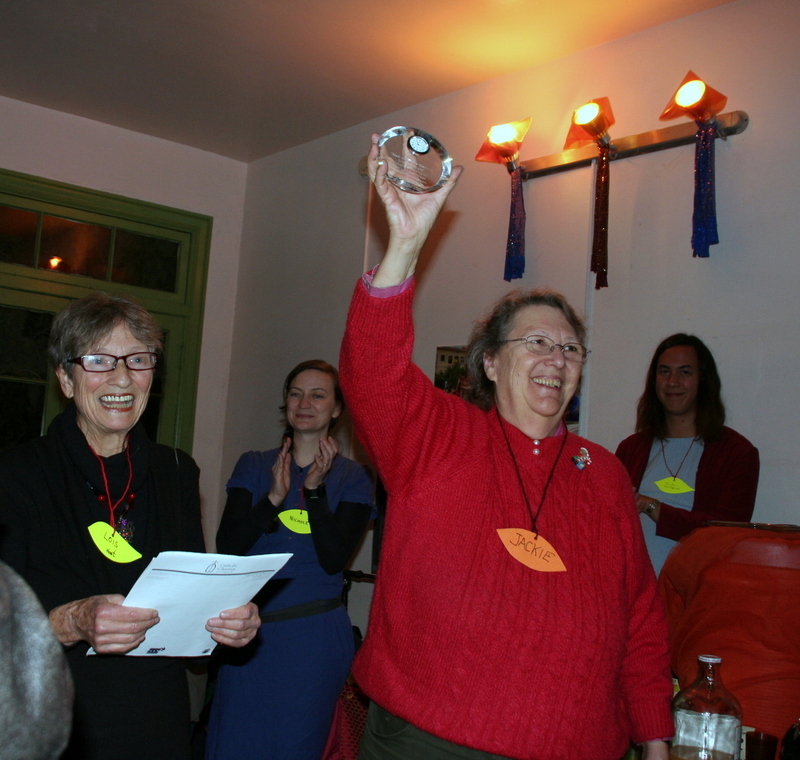 A silent auction and raffle event were organized by members Claire Bergen and Laura Allen. LAEV members Yuki Kidokoro and Ianne Lavigne took some terrific photos as did our cohousing consultant and friend Raines Cohen from San Francisco. Yuki K. and Irma Garcia along with our friend Tina Mata helped check folks in at the door. 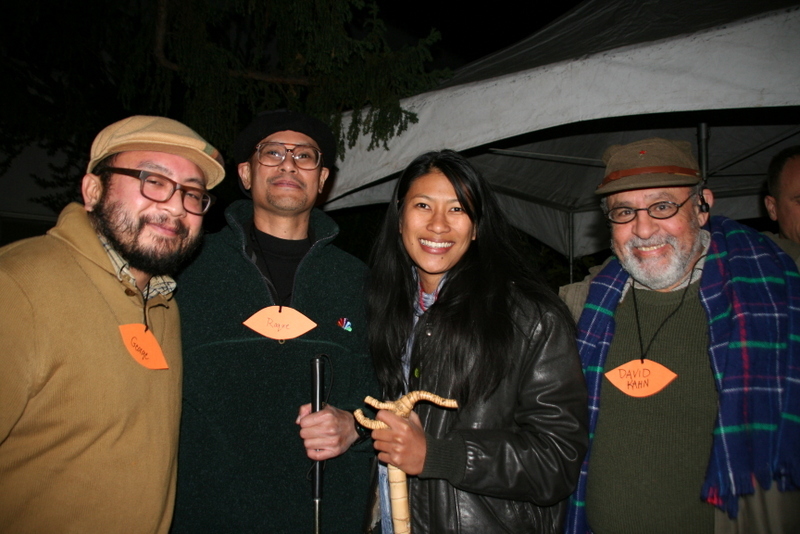 Other Eco-Villagers circulating to host the event and welcome our guests included Eco Maya Festival producer Julio Santizo, Peter Ralph, George Patton, Melba Thorn, Randy Metz, Somer and Aurisha Walters, Eric Roman, and Michelle Wong. 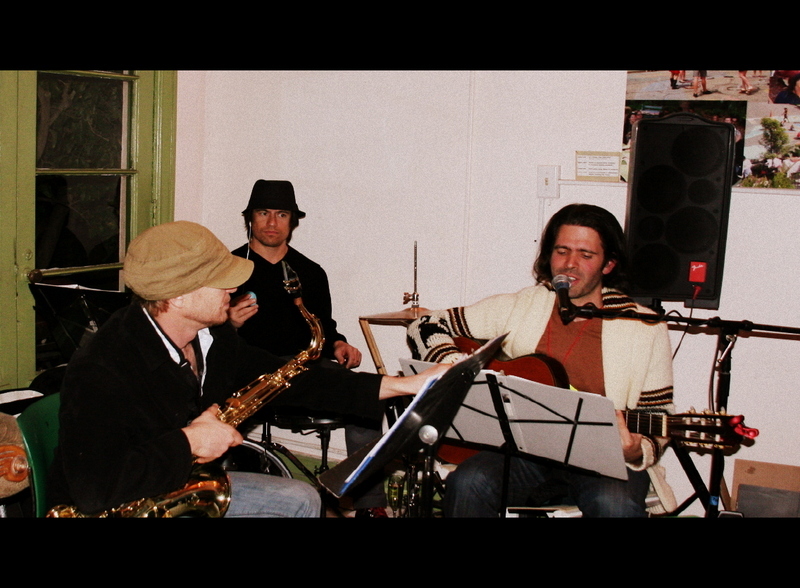 Eco-Villager Thiago Winterstein DJed for the event, and, with his musician friends, Elizabeth Perry Dickson, Matt Dickson, and Clark Skelton, provided mellow live Brazilian bossa nova. Los Angeles Country Bicycle Coalition staff Chris Barnes provided volunteer bicycle valet service. LA Walks’ Deborah Murphy couldn’t join us but graciously loaned us her catering supplies making our effort at holding a zero waste event very successful. 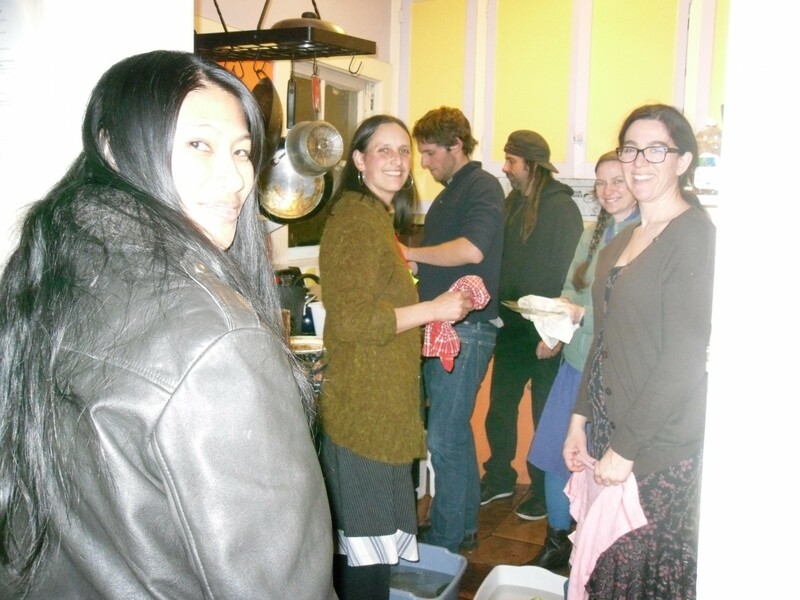 Midnight dishwashing party with LAEV Intentional Community members (photo by Lois). 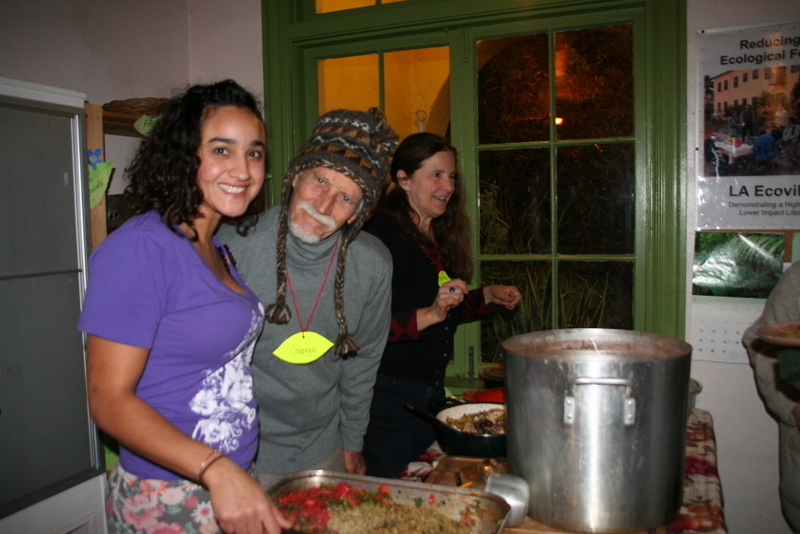 We had planned to debut our outdoor courtyard kitchen (coordinated by LAEV member and Greywater Action co-founder Laura Allen) for the dish washing activities, but the cold weather resulted in our carting all the dishes up to our community room for the midnight dish washing party spearheaded by Eco-Villagers Melba Thorn and Ana Paula Noguez Mercado, then joined by members Nichole, Becca, Yuki, Eric, Michelle, Laura, Jordan and Randy who finished the job. KCET’s “Engaging Spaces” blogger and LAEV friend George Villanueva describes the highlight of the evening as we honored our former LAUSD School Board and City Council member Jackie Goldberg “who fought side by side with LAEV to make the physical and social space for the Village that we see today.” George goes on to quote Jackie saying “how LAEV members ‘not only talk about what to do, but live it and demonstrate it. '” Go here to read the complete blog post. 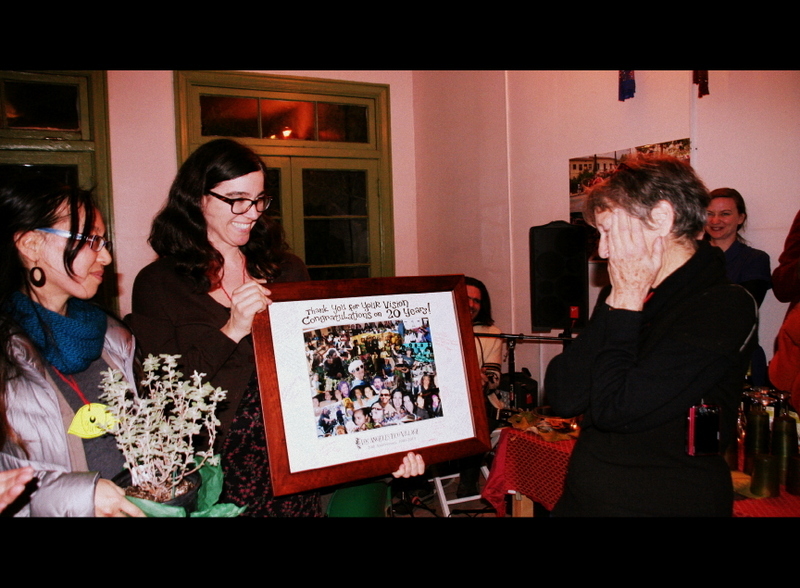 We presented Jackie with a small crystal plaque with the engraved words “Thank you Jackie Goldberg for giving us a garden plot instead of a parking lot” to honor the many times she helped save the LAEV neighborhood from being razed for a new school, especially because there were better alternatives. Jackie set the precedent which ultimately resulted in the saving of the northeast corner of Bimini and White House Place for the White House Place Learning Garden instead of more asphalt. Currently in development, the corner will eventually host gardening instruction for kids from eight schools within walking distance of LAEV. Eco Maya Festival Producer and BVCLT Board member Julio Santizo (photo by Yuki). development of the Beverly-Vermont Community Land Trust, which now owns the land underneath that housing. The White House Place Learning Garden has also been spearheaded by Lara’s boundless energy. She will, of course, continue as a valued member of our LAEV Intentional Community. 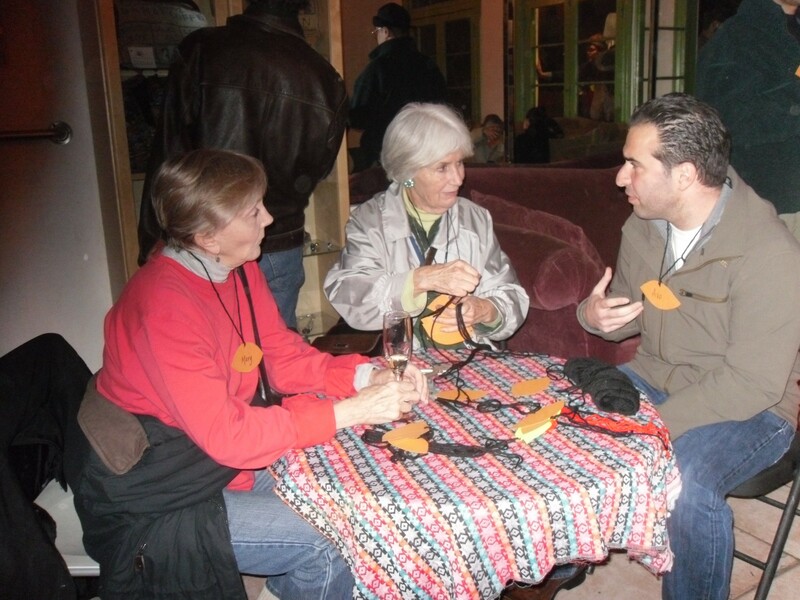 Eco-Home Network Founder Julia Russell, now retired, chats with new Sherman Oaks ecohome creator Avo Babian and former EHN Board member Mary Proteau (photo by Lois). More media coverage was provided by Koreatown News staffer Leyna Chon. Referring to Jackie’s comments, Leyna states “Noting the recent natural disasters around the world and the unusually cold LA weather that evening, Jackie also emphasized the urgency of LAEV’s cause,” referring to the increasing volatility of climate change. Leyna’s article on LAEV is one of the most comprehensive in recent times, referring in some detail to our Housing Co-op and Community Land Trust, the LAEV membership process, the Arroyo SECO Network of Time Bank, and more. See full article here. and environmental activist Roque Bucton, long time affordable housing activist Sheila Bernard; Beverly-Vermont Community Land Trust co-founders and Board members Tina Mata and Helen Campbell; LA County Bicycle Coalition co-founder Ron Milam, popular permaculture activist Hop Hopkins, attorney and social activist Adalilila Zelada-Garcia, Cal State Chicano Studies and Urban Planning professor David Diaz, Sherman Oaks ecohome creator Avo Babian, and school garden activist Mud Baron. 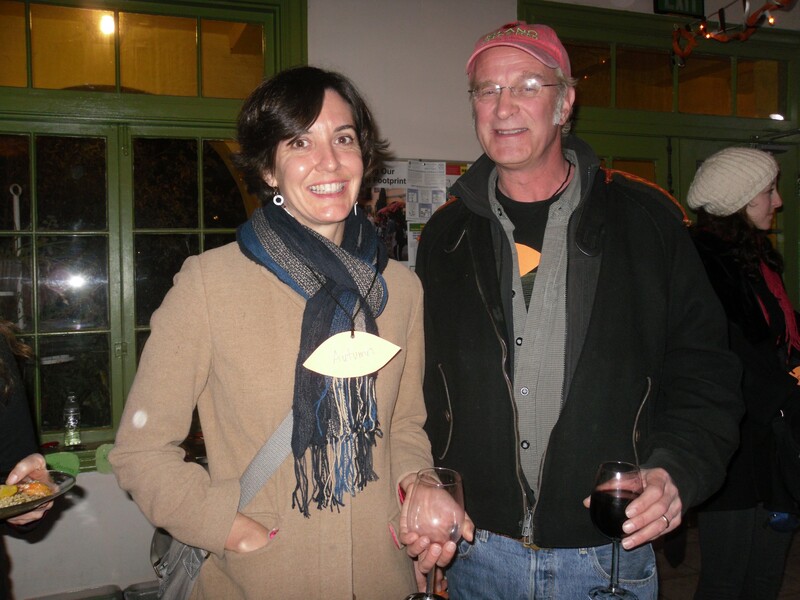 Long time LAEV friend Hop Hopkins with daughter (photo by Yuki). LAEV community, but they really did it. After the photo presentation, long time friend and colleague Julia Russell made some very moving comments about our friendship, followed by Tina Mata’s words of appreciation. 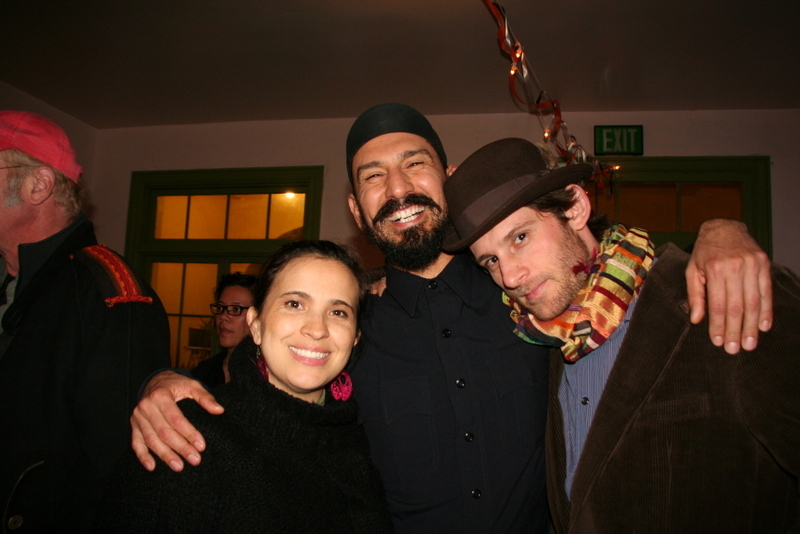 Here are a few of Julia’s words: “…In my opinion, it’s the most evolutionary project in all of Los Angeles, demonstrating a society of economic and social democracy rooted in ecological wisdom. Yes, it’s true, as Lois never tires of reminding us, none of us do what we do, or did what we did, alone. It’s the armies of people that catch the vision and the fire of inspiration and opt to become part of it and give it their energy and commitment that actually bring it to fruition.” (Do email me if you would like to see Julia’s entire comments crsp@igc.org.) If ever there is a time to make you feel humble, it is when something like this happens, so completely unexpected. So, yes!, what a night it was to remember. 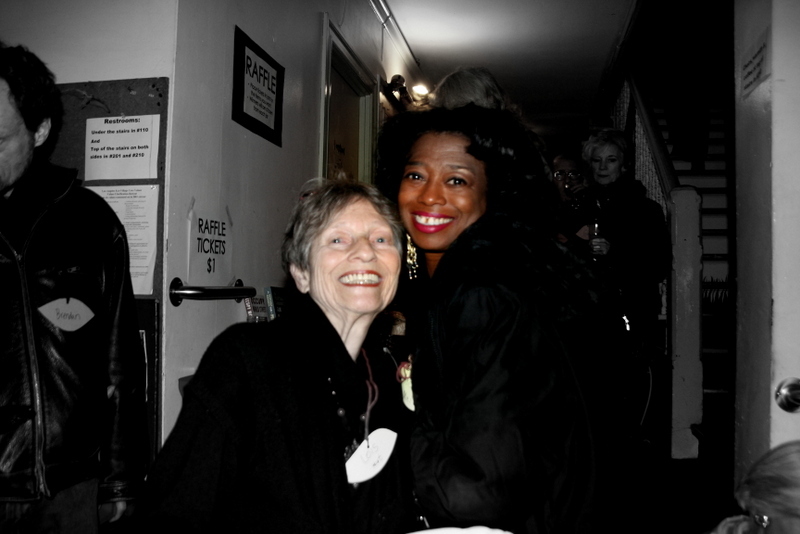 As an old lady of almost 77, who knows if I’ll be around for the 25th or 30th Anniversary party or not, and/or what shape I’d be in by then, to appreciate such lovely warm and inspiring thoughts? So a great big public thank you to a wonderful community, one that knows how to throw a great party and make the most brash amongst us feel a tearful and speechless humility. But, ultimately, the message has got to be: let’s not take 20 years to create thousands of transitional urban ecovillages. We’ve got the tools, and, already, there are dozens of eco community initiatives happening right here in the greater Los Angele area. What we call them is not so important as what people are doing in their neighborhoods to connect, collaborate and cooperate with one another for creating an ever higher quality of life at an ever lower environmental impact. We’re nearly out of time so better to make change happen deeply and rapidly and with all the justice we can muster in the process.